Especially since the Vibrant Parish movement was started in our Church worldwide some eight years ago, parishioners have expressed interest in expanding their pastoral outreach into the community around them. There is involvement in soup kitchen initiatives at other parishes, visiting nursing homes and Welcome Home. There have been charitable fundraising drives for various causes here in Winnipeg and beyond to other countries - especially Ukraine, of course. One of the more local pastoral activities was prison outreach. Parishioners, like Nadia, were involved in past years on an individual basis as volunteers, but it never became a parish ministry per se. 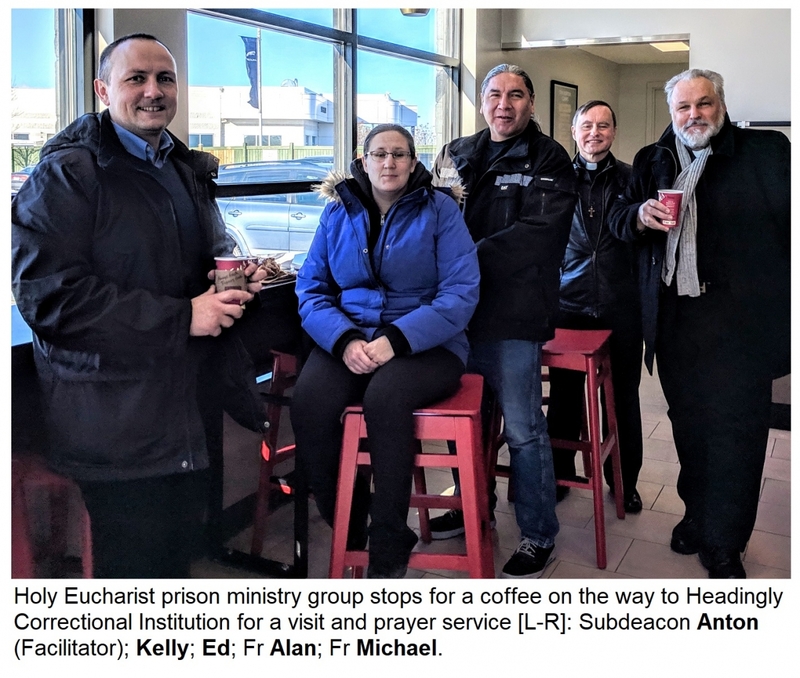 It wasn't until last year, however, with Holy Eucharist Parish receiving Subdeacon Anton Sloboda as a pastoral intern that the prison ministry opportunity got off the ground. 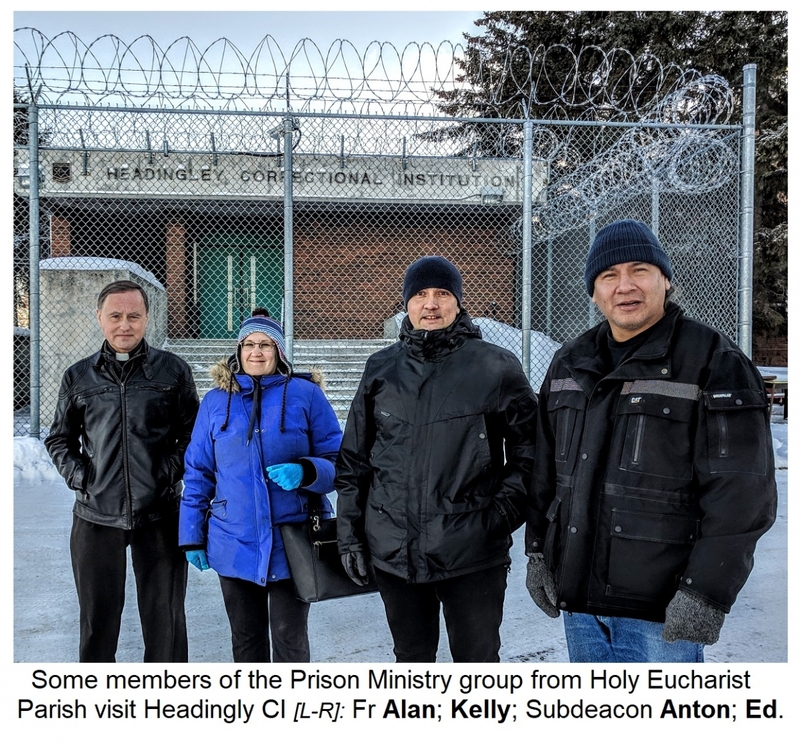 Subdeacon Anton had several years of prison ministry experience in Ottawa and when he learned of our interest as well, he soon made contacts and became involved himself. Parishioners and friends of the parish have since taken a keen interest. One of the latest events was a trip of interested individuals to the Headingley Correctional Centre. Anton coordinated the visit and took care of the necessary arrangements, including the clearances needed for the visitors. Five people set out from Holy Eucharist at noon and were able to spend several hours at the Headingley Jail meeting with some of the pastoral ministry staff - including Catholic and Anglican chaplains and volunteers. Catholic lay Chaplain, Greg Dunwoody has been involved with prison ministry for many years - some 20 years at Headingley. He met with the Holy Eucharist five in the ministry facilities in one of the sections and they all were able to engage in a Q&A about the jail and the ministry program. The highlight was a prayer service with a group of inmates - that included singing, sharing reflections, witnessing and then just social chatting afterword. It was in a joyful spirit that everyone left the prayer site. Following the prayer meeting the group met again with Chaplain Dunwoody to talk more about the ministry. The group learned more about the workings of such a ministry at Headingley and the needs and the challenges and opportunities. The experience was a blessing and will surely be a pivot for all the participants to become more involved and to grow the ministry in the Parish - as is the plan - and, God willing, throughout the Archeparchy. There are individuals in other parishes in the Archeparchy - like Sts Volodymyr and Olga Cathedral and St. Basil the Great parish. It is hoped that perhaps eventually a united outreach effort will develop.